This GW Security CCTV Systems has 8 wide angle IP cameras + NVR with a 3 TB pre installed hard drive. It’s a complete in the box security system that records in gloriuos full HD resolution ( 3 times the resolution of half-hd 720p systems. The picture quality with this system is simply outstanding, as you would expect at this price point. Data is transferred over 8 Ports at speeds up to 100Mbps. The cameras are powered by a single ethernet cable which transfers footage to the NVR and links seamlessly to the Web. The cameras shoot extremely wide right down to 2.8 mm. Night vision, streaming and smartphone and internet monitoring in real time is supported. Need Full Scale Image Clarity? Each IP cam offers 5.0 megapixel images at a pixel size of 2592 x 1920. This results is more than 2 million pixels capturing your footage which results in incredibly sharp images with lots of detail. In the right light, or with enough illumination during night vision mode the clarity of the images is astounding. If you have a large screen or full HD security monitor you will appreciate the depth of detail. 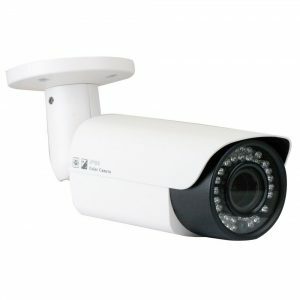 Toughened materials makes each camera vandal and weather resistant. You can adjust the view angle of each camera from 98 -22° as the 2.8 to 12mm varifocal lens offers a lot of zooming and browsing range. An extreme wide angle of view eneables you to check out your surrounding area in full HD clarity so nothing is hidden or obscured from your view. Camera Format:1080 P @ 30fps (adjusts to 1920P). Alarm: 4ch inputs/ 1ch output. 1 x GWSW0801M: 8 Ports PoE Switch.